The new global warming speedometer shows in a single telling graph just how badly the model-based predictions made by the Intergovernmental Panel on Climate Change have over-predicted global warming. 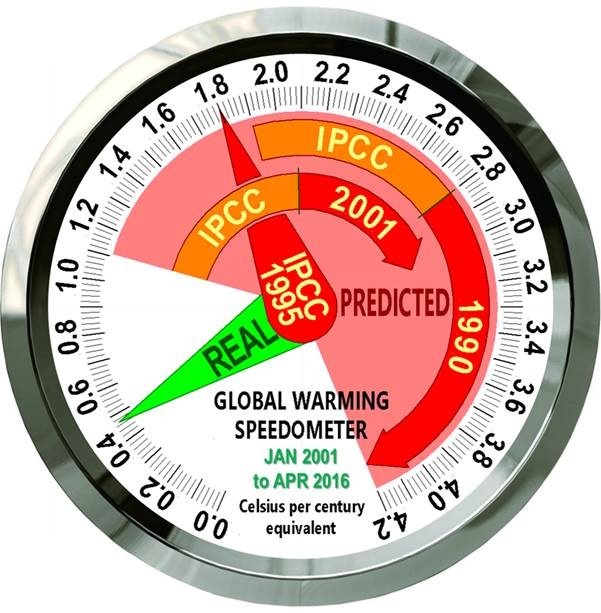 The speedometer for the 15 years 4 months January 2001 to April 2016 shows the [1.1, 4.2] C°/century-equivalent interval of global warming rates (red/orange) that IPCC’s 1990, 1995 and 2001 reports predicted should be occurring by now, compared with real-world, observed warming (green) equivalent to less than 0.5 C°/century over the period. RSS and UAH monthly near-global satellite lower-troposphere temperature anomaly values for each month from January 2001 to April 2016 were assumed to be broadly accurate and were averaged. The least-squares linear-regression trend on their mean was determined and found equivalent to 0.47 C°/century. Is much of our effort to combat global warming actually making things worse? Author Jonathan CohlerPosted on May 24, 2016 Leave a comment on Is much of our effort to combat global warming actually making things worse? In my most recent post, I discussed yet another incident in the long running dispute about the inconsistency between models and observations in the tropical troposphere – Gavin Schmidt’s twitter mugging of John Christy and Judy Curry. Included in Schmidt’s twittering was a diagram with a histogram of model runs. In today’s post, I’ll parse Schmidt’s diagram, first discussing the effect of some sleight-of-hand and then showing that Schmidt’s diagram, after removing the sleight-of-hand and when read by someone familiar with statistical distributions, confirms Christy rather than contradicting him.